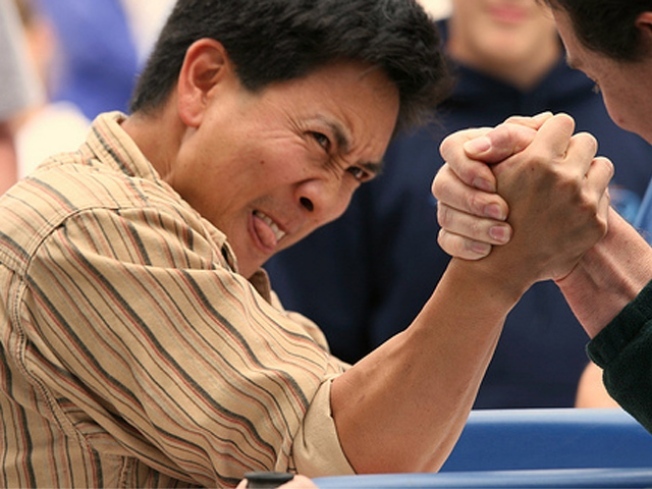 Flex with the pros at the 32nd Annual White Castle Queensboro Arm Wrestling Championships. Or just be a spectator. Much less work. ARMED AND READY: …The 32nd Annual White Castle Queensboro Arm Wrestling Championships, at which more than 100 men and women will come to grips in 13 Amateur and Pro weight class categories. Anyone can enter, by the way, but be forewarned: These people mean business. Sunday, 1PM. ARRIVEDERCI: The 82nd Feast of San Gennaro will pack up its ferris wheel and sausage pep’ carts on Sunday night, and – like every year -- rumors will fly that this is the feast’s last year in downtown Manhattan. True or not, you should go. Ride the wheel, dunk a clown, take the cannoli. Saturday and Sunday, 11AM-late PM. BREATHE: Sluggish? Do something for your body with zero financial commitment: YogaWorks’ crack instructor Kristin McGee will be on hand at Union Square’s Lululemon boutique, leading a massive, free introduction to pilates class on Sunday morning, 10-11AM. PORKY’S: If your idea of exercise involves repeatedly lifting your hands to your mouth, then Il Buco’s sixth annual Sagra del Maiale – that’s pig roast, to you – may be more your style. They prep the bonfire before dawn to roast a gorgeous 200 pound heritage breed Crossabaw Pig. And if that’s not enough, there’ll be plenty other tasty morsels afoot, including delectable apple ricotta fritters.